Foe a driftwood effect on these wooden house sign we sand-blast the background away to leave the lettering showing. 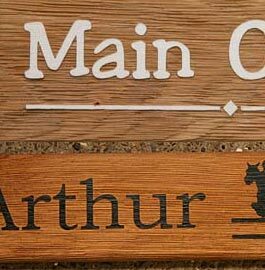 Wooden Signs Overview - Wooden Sign Images - Gallery Menu- Oak House Signs - House Numbers - Carved Rustic House Signs -Elegant Range - Iroko - Douglas Fir - Sapele - Cedar - Cherry - Posts & Brackets - Large Signage - Which Timber? These are very unusual and really do show the beauty of the grain. The letters are protected by special rubber stencil and the background is sand blasted away leaving the driftwood effect. 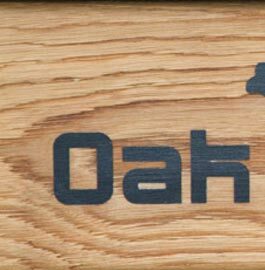 We normally use Iroko or Red Cedar but can use oak or sapele (similar to mahogany) Oak has the most pronounced driftwood grain effect but very little depth to the letters. We usually finish with Devon Oil or Osmo Oil. The red cedar signs are made using 40mm thick timber whereas the others are 25mm. The letters are slightly raised above the driftwood effect background. Colours - Black, Brown, Ivory and Green. We can use most common fonts - for a selection CLICK HERE For this type of sign it is best to used a bold font without any thin lines or tails. Letter size depends on the number characters but the minimum size is 30mm. This is size 9 on our sign sizing and layout tool. We can include simple pictures on the signs. We have a selection of Standard Pictures - CLICK HERE - or you can send in your own artwork - It must be a silhouette style image without any very fine lines or shades. The cost is £9.50 per standard image or £29.50 for a jpg or other bitmap image. If you do want an image the maximum number of letters is reduced by three. Holes can be drilled at 85p per hole or as an alternative to holes you can use CT1 - a very powerful adhesive which is easy to use and is £14.35 click here for more information on CT1. 40mm RED CEDAR Length 12"
NB If you use the maximum number of letters, the letter size will be 30mm. With less than the maximum, letters size is increased to fit the name aesthetically on the sign. Made in the UK. Our team at The Sign Maker looks forward to helping you with your driftwood effect sign.